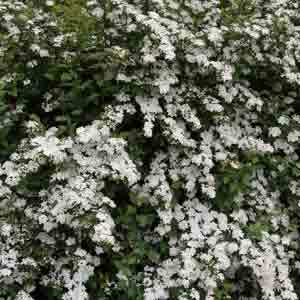 Spirea are a long flowering low growing shrub useful for borders, a fairly hardy plant best suited in a well drained well mulched soil with plenty of sun. Fast growing, easy care and free flowering they make an excellent landscaping plant. Over 60 species are available, however only a few of the better forms are offered by wholesale growers. Most spiraea will flower from late spring though to autumn and are generally hardy landscaping plants. They do require a well drained soil, however will cope with poorer soils. All species except the variegated forms grow best in full sun to light afternoon shade. S. cantoniensis ‘Flora Pleno’ (syn S.lanceata) with the popular ‘Reeve’s Spirea worth seeking out. S. thunbergii – Masses of white flowers on a drought tolerant plant. Pink to white flowers in summer months. Look for new varieties such as the Fleming’s release Spiraea x bumalda ‘Dolch .